Ghost Lines (working title) I am interested in exploring the relationship between people and the environmental impact of ghost nets/lines that fishermen discard into the oceans. I would like to experiment with creating an installation using photography, the ghost nets/lines, fishing hooks and sinkers. I have been gradually collecting fishing lines that have been trapped between reefs for several years with the intent of repurposing it’s use through my work. (see next page for examples) I am also interested in photographing persons, particularly from sea side communities. 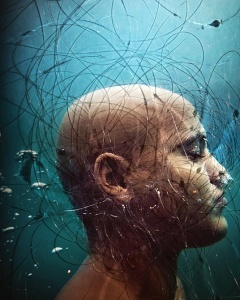 My intention is to submerge these portraits in a container with sea water from that particular region and overlay these images with the fishing lines I dive up and then rephotographing the image. My hope with this work is to initiate a conversation about human impact on the environment, particular with regards to ocean pollution. In Fighting the Currents, I have been taken on a journey through a strong current from the shore into the depths of the sea, to being stranded far out in the ocean. Fighting the currents explores this journey through a process of time and repetition, where I examine the relationship of these parallels through the experimentation of photography, video and the use of social media and the interactive web. Circa No Future is about believing there to be a link between an under-explored aspect of Caribbean adolescent masculinity and the freedom of bodies in the ocean, photographer Nadia Huggins decided to creatively document boys’ interaction with the sea. These pieces capture manhood, snippets of vulnerability and moments of abstraction, that often go unrecognised in the day-to-day. The ocean itself takes on a personality – that of the embracing mother providing a safe space for being – which is both archetypal and poignant. Nadia Huggins is a self-taught conceptual documentary photographer from St Vincent & the Grenadines. Her photographs explore Caribbean culture and identity through people, self-portraits and the landscape. Her work has been published in, ‘Pictures from Paradise: A Survey of Contemporary Caribbean Photography’, and ‘See me here: A Survey of Contemporary Self-Portraits from the Caribbean’. She has exhibited worked in ‘Wrestling with the Image: Caribbean Interventions’ in Washington, DC. ; ‘Pictures from Paradise’ at the CONTACT Photography Festival in Toronto, Canada; and ‘In Another Place, And Here’ at the Art Gallery of Greater Victoria, BC, Canada. She has received a photography award at the FESTIVAL CARIBEEN DE L’IMAGE du Mémorial ACTe in Guadeloupe for her Circa no future series. Huggins is also the co-founder of ARC Magazine and a full time freelance graphic designer.